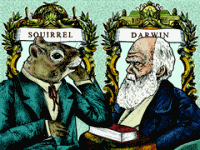 A two-man comedy by Michael Merino, Squirrel is a dialogue between nineteenth-century naturalist Charles Darwin (played by Ian LeValley) and an American Grey Squirrel (played by Carlos Bustamante). The play is presented as a series of skits, jumping about about in time and setting but roughly following Darwin's life between his voyage on the HMS Beagle and his writing On the Origin of Species. Bustamante brings the Squirrel to life with only a grey hat with ear flaps, and his own squirrelly movements. Surely, this isn't Carlos Bustamante the MacArthur Fellowship-winning population geneticist? It'd be hilarious if it was. According to "Honey Badger" this is being performed again right now, and will also be on tomorrow (Sunday, Nov 27) at 3PM.